How About some Crafty Tools? Looking for the Right Tools? You’ve managed to lay down a beautiful hardwood floor. As you stand there admiring your handiwork, your partner steps up and gives you a big hug for a job well done. Then, they quietly point to the pile of scrap wood in the dining room. If you’ve ever installed a hardwood floor, or are about to, here are some scrap wood projects to keep in mind for when you are done. Some of the projects are simple and require a saw and some glue. Other projects require more expertise and tools. You can always talk to a cabinet maker or contractor if you need help. See if you can cut a deal to pay for their time and skill. A quicker way to unload your scrap wood is to sell it as a lot. For the DIYer who loves projects, we’ve separated them into long, medium and short depending on the length of boards you have. For our article, we consider any wood floor scraps with a length of 30 in. or more to be long. You’ll find some excellent projects to repurpose excess flooring if you have long hardwood floor scraps. Choose your project wisely so that you don’t run out, or you’ll need to order more flooring, and that would defeat the purpose of the project. Remove the baseboard. Cut floorboards to equal lengths and glue them to the wall with construction adhesive. 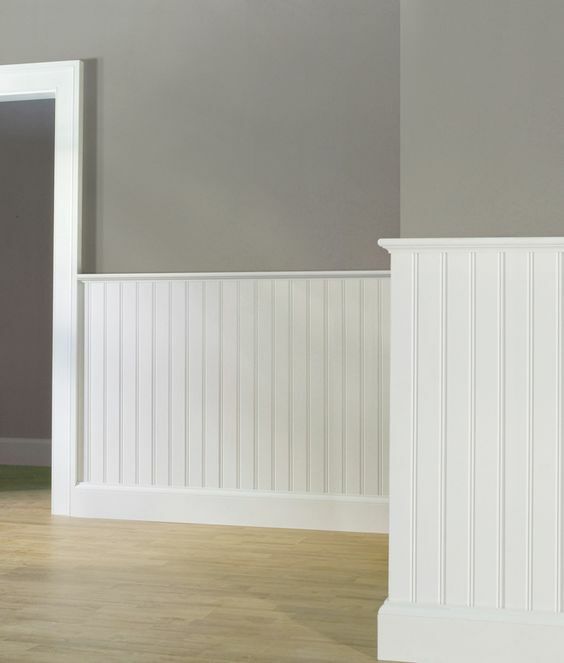 Reinstall the baseboard and add a top decorative molding for a finished look. This is an easy DIY job. 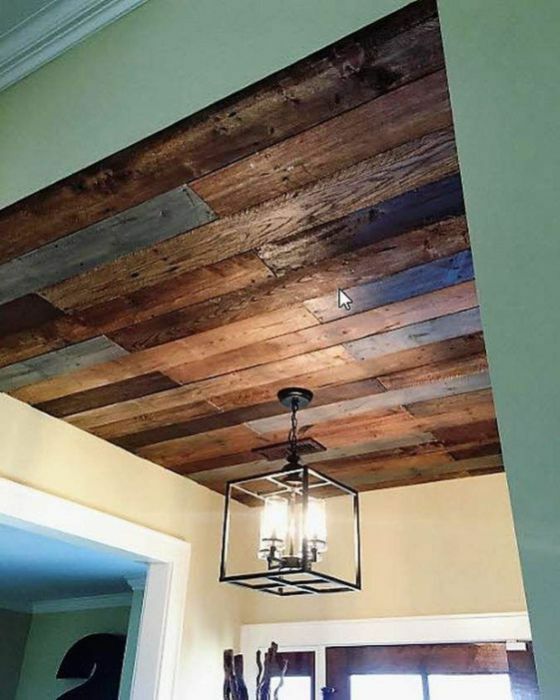 Create a Scandinavian look by covering any ceiling with wood. This works well in small rooms with neutral carpeting or upstairs rooms that have pitched ceilings. If you happen to be good at carpentry, use the scraps to make beautiful cabinet doors for the kitchen or your workshop. Use the floorboards for the frames and glass or beech plywood for the center. You can find plans for coffee tables online. 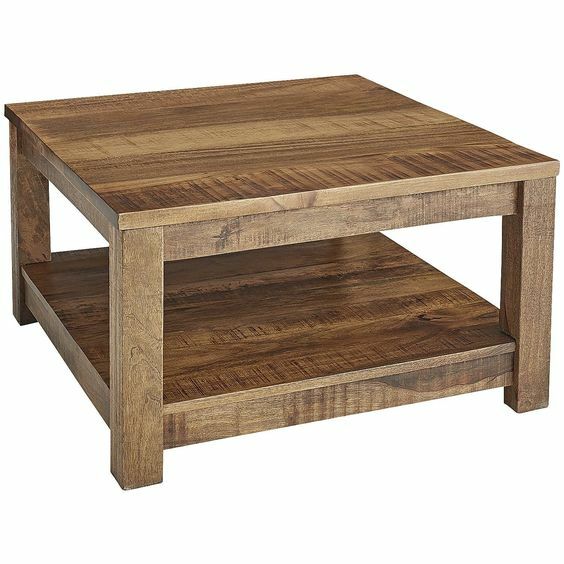 Solid hardwood floor is the perfect material to build a solid coffee table. Prefinished hardwood floor scraps make an elegant accent wall. Hardwood has a unique natural beauty that makes it perfect for an accent wall. It’s also perfect for a wall behind the bar in your man-cave. If you still have a pile of medium length scrap wood, read on for more project ideas. For medium length wood of 12 to 29 inches, there are many projects you can do to recycle those hardwood scraps. Here are some project tips to get you started. Cut boards 18” long and place them side by side until you have enough to cover 2 to 2.5 feet wide. Use a ¼ inch drill bit to drill four evenly spaced holes through each board. Make sure they line up with each other. String together with rope, tying a knot between each board to use as a spacer. Place it in a sheltered area, not in direct contact with the elements such as a covered porch or garage entrance. Refacing is like the wainscoting idea, except you’ll lay the boards in the front of the breakfast bar or surround an island with them. Lay the wood at an angle to create an exciting feature. Of course, it depends on the décor of the kitchen. You can always paint it. The wood will still add texture. Tongue and groove repurposed wood make an excellent cleat hanging system for headboards or large heavy art or mirrors. Attach one long piece to the wall with anchors. Then attach the other to the object, perpendicular to the cleat on the wall. Now hang the object on the cleat. Here is how to make a French cleat from scratch. Unlike scrap 2x4, the advantage of using hardwood floor scraps is that it’s ready to cut and use. 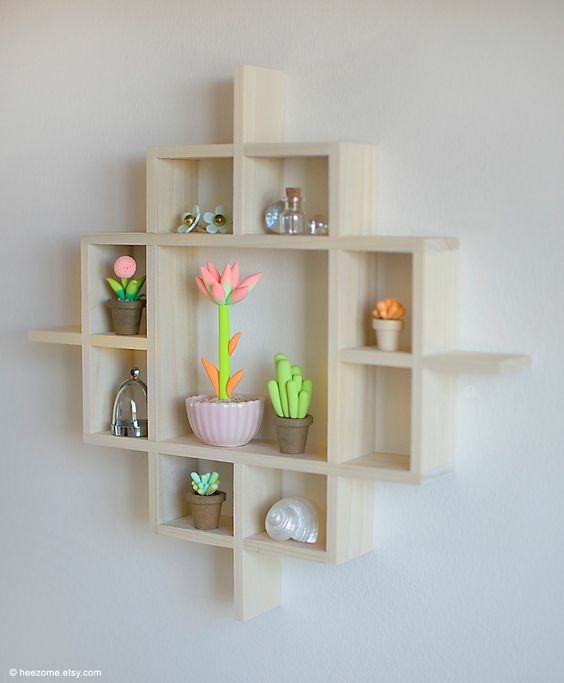 Wooden boxes shelves also known as shadow box frames are creative ideas for your leftover wood. 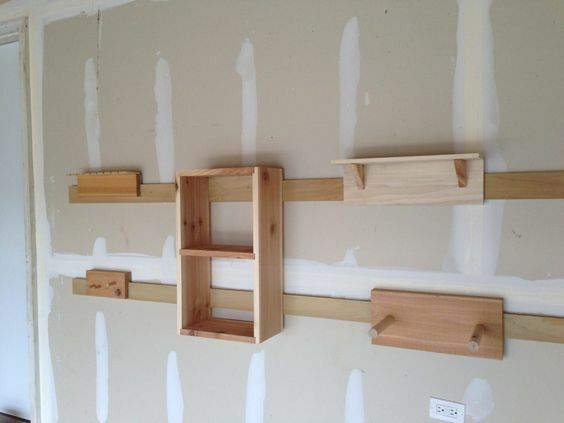 Box shelves are functional and add an artistic dimension to any wall. Create geometric designs using basic joinery. If you have short pieces, less than 12 inches, you’ll find many things to make out of wood. There are plenty of scrap wood projects for short hardwood pieces, limited only by your imagination. 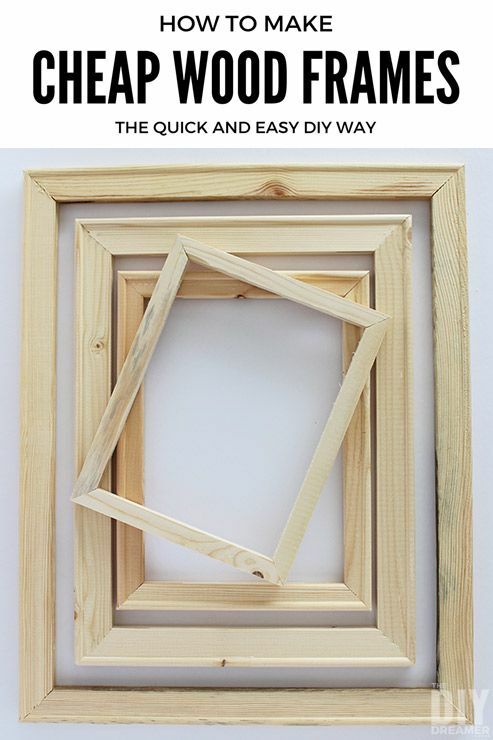 Cut four pieces at a 45-degree angle to make beautiful wood picture frames. You can make any size frame for large paintings and portraits too. The tongue and groove will hold the glass for the frame. There are hundreds of toys you can make from recycled hardwood floor scraps. There is probably no higher purpose for repurposed wood than a child’s toy. From small trains that run in a wood track to rocking horses, hardwood floor scraps make the perfect building material. We’ve included a few videos to help you get started on a toy project. There is nothing like a couple of straight pieces of solid hardwood floorboards to make a sturdy tool. Here are some ideas. 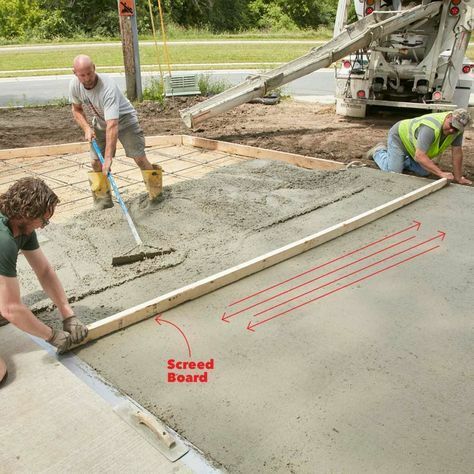 A T-square is always handy to have around for cutting sheets of plywood or sheetrock. Fasten a long and short piece together at a 90-degree angle using a couple of nuts and bolts. Add measurement lines with a marker and tape measure. Use a piece of scrap wood to level sand for a brick walkway or as a screed to level concrete. It holds up better than a pine 2x4, and it will have a much straighter edge. From serving elegant salads to fishing bread out of the toaster, wooden tongs are unique, safe and eye-catching. They are a fun and easy way to use up short pieces of wood scraps and make lots of holiday stocking stuffers. Watch this video on how to make wooden tongs using hardwood scraps. 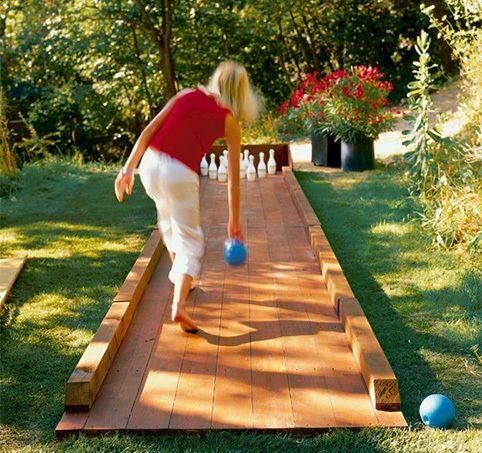 How about a bowling alley in your backyard? Think out of the box and onto the alley, a bowling alley that is. That’s right. Create a portable or permanent bowling alley for indoor or outdoor fun. You can create it as simple or as fancy as you like. The solid hardwood floorboards create a smooth surface, perfect for a fun bowling alley. It’s the ultimate wood recycling, scrap wood project. Here is how to build a bowling alley. If you’ve removed an entire floor and replaced it, there is a good chance that you can sell it. You can find wooden scrap buyers who buy recycled floors. There is demand for repurposed wood. Check online, or you can list your lumber on Craigslist. If you over purchased, ask your dealer to see if they will repurchase any of it. Laying hardwood floor is straightforward, and you don’t need that many tools. However, building furniture requires more tools and more skills. Here are a few tools you’ll need to handle any project. This multi-purpose tool substitutes for a whole set of common solid tri-squares, a 45-degree miter, depth and height gauges, marking or scribing gauge, a level, a plumb. You can also use it as a precision rule. These flexible abrasive coated foam blocks allow you to sand curves and hard to reach places. Use them on curved, contoured or flat surfaces of wood, metal, paint, plastic, ceramics, and drywall. The dimensions of this hand-held coping saw are blade length - 6 1/2-inch, overall length -13 1/4-inch, throat depth - 4 3/4 inch. Perfect for cutting small detailed curves. Make any project go fast and easy with this powerful 15 Amp, 3,800 rpm miter saw. Cuts lumber up to 2x14 at 90 degrees and 2x10 at 45 degrees. It will make light work out of any scrap wood project. Cleaning up after your wood projects has never been easier. It features a 5hp motor and a 4-gallon tank, enough to hold a winter’s worth of wood project sawdust. To see more tools, visit Easiklip’s wood flooring tools and supplies page. One thing you don’t want to do is burn your wood scraps. Unless the wood is unfinished, it will contain stains and polyurethane which is toxic when burned. Don’t use it for grilling, smoking or your wood stove. Scrap wood crafts that use hardwood floor scraps can save you money on material costs. You’ve already paid for the wood, why buy more? Recycling wood is better for the planet because you use all the wood from a tree that may have taken 80 years to mature. You’ll save a tree and save money by making gifts for the holidays. Amaze your family and friends with these hand-made wood projects.